Harmony EFX, Pitch Shifter / Time Stretcher from Antares Audio Technology. 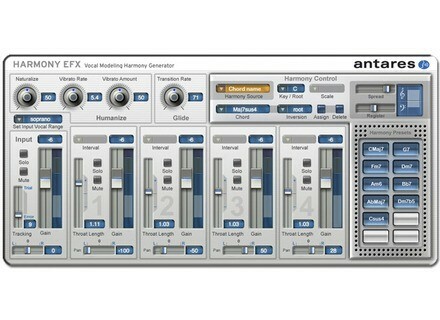 Antares Audio Technologies has announced the upcoming availability of Harmony EFX, a streamlined version of Antares' Harmony Engine Evo Vocal Modeling Harmony Generator. Evo Voice Processing Technology for pitch shifting, & natural-sounding (if you want it to be) throat modeling. Four harmony voices with independent pan settings. Antares Throat Modeling technology that lets you process each harmony voice through a physical model of the human vocal tract. o Fixed or Scale Intervals: Simply set the key and harmony voice intervals and let Harmony Engine Evo do the rest. o Chord Degrees or Chord Name: Define your harmony chord-by-chord, complete with inversions and variable vocal ranges. o Chord by MIDI: Define your harmony in real time via a MIDI controller or pre-recorded MIDI track. o MIDI Omni: Directly "play" the four harmony voices as if they were voices of a synth or sampler. o MIDI Channel: Use four separate MIDI channels for absolute control over each note of your vocal arrangement. Spread and Register controls that allow you to set the pitch range and harmony style of your vocal arrangement. 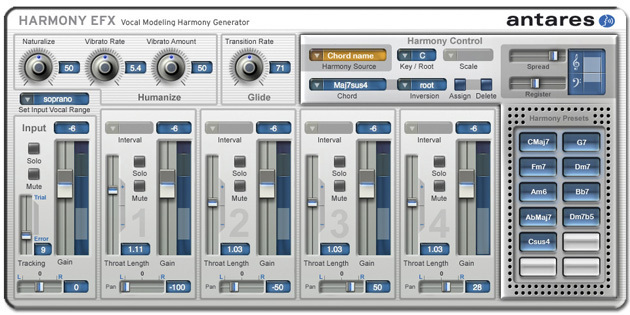 Humanize functions that provide selectable amounts of variation to each harmony voice. A Harmony Preset matrix that lets you create up to 12 complete harmony settings and instantaneously recall them in real time or via automation. As an introductory special, from its release in mid October through the end of November, you can buy Harmony EFX for $49 (MSRP $129). It will be released for Windows and Mac OS X in VST, AU and RTAS plug-in formats on October 15th, 2009.
discoDSP Vertigo for Mac discoDSP has announced that Vertigo for Mac has been released and can be purchased now for €75 / $99. Tribal Tech House From Sample Magic Tribal Tech House is a new collection from Sample Magic with deep, percussive big-room grooves. Kreativ Sounds SYN ImpOSCar Sounds v1 Kreativ Sounds presents SYN ImpOSCar Sounds v1, a collection of 24 sounds for the GForce ImpOSCar synthesizer.